Arctic: I just came to say hello! 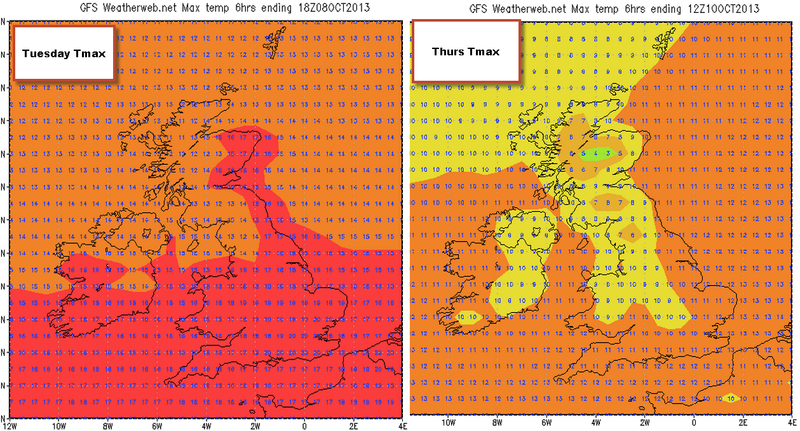 Update: cool off will be a fall of 10c for much of the UK. Spot the difference below! These are Tmax temps: from high anomalies to October normal. The UK enjoyed being on the warm side of the HIGH this weekend and this will last for a day or two still. However, a significant shift in the position of the HIGH pressure by models has placed it moving out WEST of the UK through this week leaving the door wide open for Arctic Air to spill out from Svalbard and make a dash for it down the North Sea. This air will be chilly! Later in the week the door closes on the Arctic but the cool air is left skulking very close to the SE in a LOW pressure of swirling showery cool air bringing rain threats to the East and SE. So while Reigate enjoyed 20c this weekend and some warm days Monday/Tues, by next weekend the best we can probably expect is half that, or thereabouts, and with heavy showers to boot. The HIGH moving west will have the effect of drawing down some brisk cold Arctic air directly from some islands called Svalbard (check out the web cam from today: this air is setting off our way very soon!) directly down the North Sea arriving in Reigate and the SE sometime mid-week having travelled across 2000 miles of gradually warming ocean surface, picking up heat and becoming UNSTABLE in its lower layers as a result. Instability means heavy showers, drifting down on the chilly northerly breeze and threatening east coast districts and the SE. 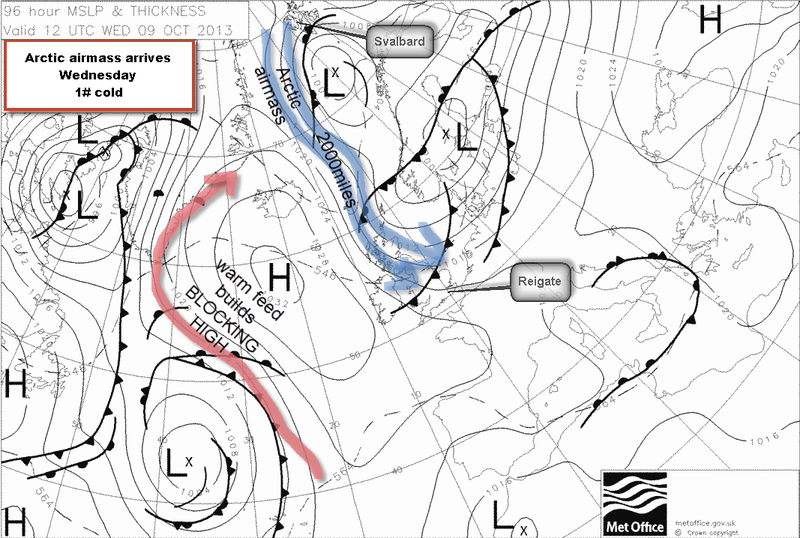 The cool pool of air will feed a LOW pressure over the near continent which will be cut-off as the HIGH topples over the North later this week, taking the jetstream and any warmer air, far to the North of the UK. The cool pool cut-off LOW thus produced is likely to bring showers to the East coast and SE England and lurk about for some time. The HIGH in the Atlantic, meanwhile, is effectively blocking any movement of these systems and the weather is likely to stay put for sometime, gradually warming through but producing convective showers as it does so. This blocked weather pattern with weak westerly winds and HIGH pressure moving slowly or not at all, is characteristic of the very negative North Atlantic Oscillation showing up at the moment. Northern blocking and HIGH than normal pressure over the Arctic with lower than normal pressure over the Azores, allows Arctic and Polar air to leak out and flow south over Europe and the UK. This was what brought our COLD late Spring 2013. Is this happening again this year? An interesting development which continues to back up several indicators that are showing the potential for a COLD winter ahead. Salt and snow shovels at the ready! The chart below is a monthly averaged CFS seasonal prediction for February 2014 anomaly air mass temps: how far above or below temps are from the 30 yr mean. 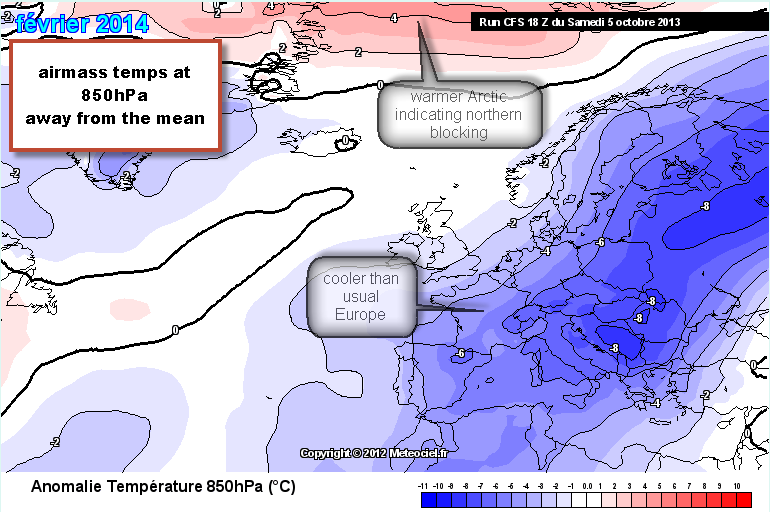 Europe, on this chart, looks v chilly (but these temps are for 5000feet, not surface!). This is not, however, a forecast, merely an indication. These charts also flip-flop quite a bit so we need to check them regularly to get an idea of patterns. So far, the cool pattern is prevailing.